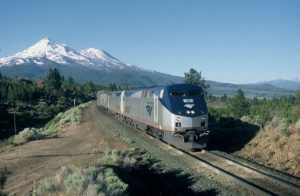 Amtrak’s Empire Builder, a long-distance route that travels from Chicago to Seattle & Portland. As America awaits a long-overdue infrastructure plan from President Trump, one opinion writer highlighted a few of America’s greatest infrastructure needs on CNN. Kate Ascher, a principal at BuroHappold Engineering, listed a number of items on which our country should focus, but first on her list was providing adequate funding for Amtrak’s interstate and long-distance rail. “Supporting Amtrak’s nationwide operations is not a political sin, but rather a necessity to ensure continued service between cities or towns with insufficient traffic to pay their own way,” says Ascher. She also highlights the relatively small amount of funding our government currently provides Amtrak, compared to other G7 countries like France and Germany. This lack of funding takes a toll in the form of less frequent and diminished service, while preventing Amtrak from investing in life-saving safety initiatives like Positive Train Control (PTC). Indeed, thousands of TCU members work on Amtrak’s long-distance routes, including clerks, reservation agents, on-board service workers, supervisors, and carmen. Unfortunately, President Trump’s FY18 Budget proposes to eliminate Amtrak’s long-distance service all-together, stating that “long distance trains do not serve a vital transportation purpose.” At TCU, we’re working diligently to ensure that doesn’t happen.